No dollar amount can be placed on the values our young people receive from a Catholic school education. It is a holistic approach that focuses on educating a young person's body, mind and soul. Where else can a student learn about the beliefs, practices and traditions of our Catholic faith, live out their faith by serving God and those in need, and receive top academic training in a safe, nurturing environment? There is no greater investment for forming our youth's future than in investing in Catholic Education. I am proud of our Catholic schools in the Des Moines diocese. We are blessed with committed leaders and educators who are dedicated in providing a Christ-centered education as well as promoting high academic standards. Our students are actively involved in the community, participate in a variety of academic, fine arts and other extra-curricular activities while consistently demonstrating higher test scores than the state and nation. We are proud of the responsible and productive citizens who constitute the alumni of Catholic schools. Your support and involvement in Catholic education will pay rich dividends for our young people, their families, the Church and society. I am grateful for all that you do on its behalf. 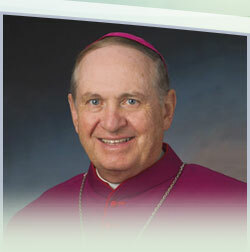 On May 17, 2012 Bishop Richard Pates announced a new diocesan policy for schools and parishes limiting youth-oriented programs on Wednesday evenings and Sunday mornings except for those related to sacramental, ministerial and/or catechetical endeavors.